The Internet giant, Google has come up with another new thing called HelpOuts to help experts in any field make money online. As a matter of fact, you can make money with Google Helpouts if you are an expert in something and you have some free time. In November 2013, Google announced Helpouts—a new way to get and give help over live video. The goal is simple: help people help each other. Google wants to use the convenience and efficiency of the web to enable everyone, no matter where they are or what time it is, to easily connect with someone who can help. HelpOuts is something that will forever change the landscape of Internet Marketing. It is a new way to connect people who need help with people who can give help over live video. Regular people like you can signup to become a helpouts instructor and charge for your time. 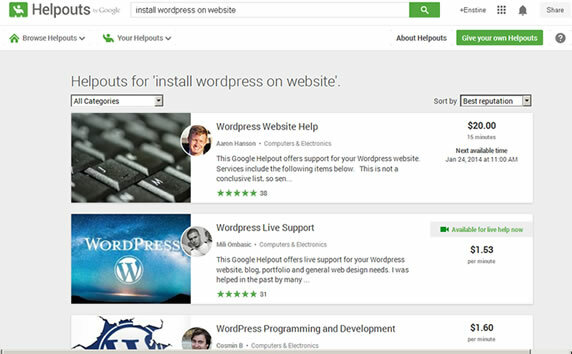 There are so many ways you can offer help on Helpouts and make money: You can teach someone how to fix his garage door, or how to remove a computer virus from his PC, how to install and configure wordpress, how to setup a WordPress plugin or Template, how to install an app on mobile phone, how to work in cPanel, how to backup database, how to use any software, etc. It basically starts from anything and ends at anything. There is no limit. People need help every moment and are ready to pay for it. You can also help people for free. That’s another way to network with many online. NB: Creating a HelpOuts account at the moment of writing this post is by invitation. However, Joel Comm can help you get your account within 24 hours. Joel Comm & Joshua Writer, two Internet Marketing specialists have put their resources together to come out with what is known to be the most advanced video training center teaching you how to make money with Helpouts. HepoutsProfit is the most comprehensive course with over 36 videos from successful Internet Marketers, you will never be wrong giving this course a try. I’m also taking the course. I don’t want you to make mistakes with Helpouts. I want you to have more ways to make money online. This is going to be the next big thing by Google. Thanks for introduing me to Google Helpouts. Going to check it out, plus the recommended course. Have you been able to earn something from it yet? Or, do you plan to offer something in future? How about you? do you intend to give it a try? Yes Enstine, I will be giving this a try definitely. I never heard about Google helpout, seems Google is trying to hit microjobs markets. This is very new to me. I am sure this is new to many of the bloggers. Thank you for introducing us to Google helpouts. I will definitely check it out. Yes it’s new to many of us. Give it a try and I’m sure you can help some people and be paid. Fabulous Mate, this is really amazing and new method to make money via helping others and this would be one of the best system for now. Thanks you so much for nice information about this. I am also going to put my head in to this, thanks for your inspirations. Google and their innovations have changed the world and they keep coming up with great innovations to help humanity, now even helpless people can hook up on a camera from their homes, help others and earn money. Provided you are an expert in your field you can make money online through this Google HelpOut and i must commend Google for this. That is the true spirit of entrepreneurship…solving problems. Once you can consistently solve the pressing problems people have, be dead sure that money would not be an issue anymore. The issue, I believe, would be how much to charge! Well to be honest i just came to know about google helpouts just now and I’d say its a great place to learn something new. I’m gonna surely check it out. This platform is still very new to most of us. Give it a try and I’m sure you’ll be helpful to so many who are ready to pay you. Cool site! Like an upscale Fiverr, where you can make real money selling your services. I dig the direction of the venture. Here’s hoping it grows and expands so anybody can join. That’s certainly a great initiative by Google, but I’m sure Google will also earn money here via commission. 😉 Anyways certainly a great way to find an expert and resolve your problem instantly. I guess now Google is targeting sites like fiverr to make more money. There would be a commission, that’s a given. But as usual, I’m pretty sure that it would be so small that it wouldn’t affect net ‘profits’ at all. My take? Go, give it a shot! Helpouts goes a very long way to prove that the various ways of making money online are truly unlimited! And who says one cannot really make a full time living online from the comfort of his bedroom? Enstine, you are the man…I’ll check out this special course and make up my mind. It’s good to see you around today and thanks for interacting again. Thanks for the kind offer, Enstine – will definitely let you know. This is a very informative and interesting article to read! Nice way to describe Google Helpouts service! Surely, it is a wonderful way and amazing system to make online income spcailly for adsense publishers. Thanks for your such kind of tips!! I will try my full efforts to shout this out from my blog! You’re so correct, Vivek – sharing is caring and so much fun! But please ensure that when you share the content on your blog, you rewrite in your own words and five credits to Enstine as the source. I’m pretty sure he would not object. And again, why not consider sharing via your social media channels? You’ll be amazed how much fun that could be! Wow Thats nicee to listen Never heard that before.. But really its a nice service and a new way to earn for their talent and a good and trustable source of income. This is really very much useful article. I love such amazing stuff here. We will try these google helpout soon. Thanks for keeping us updated. Great and thanks for sharing. I heard about this but yet to find time for it. Let’s see if I can squeeze some time out from it and keep you informed! Appreciate the kind share mate. I have never heard of Google Helpouts. Another interesting way to make some money online. Also, I see people are posting help for free, I guess for increasing their audience or authority. Have a great rest of the week, Enstine! Thanks for sharing this information, I never heard about this feature. It is an amazing feature by google. Yes, I think you are right with Helpouts, google is now trying to target the micro job market. I’ve never heard about Helpouts before! Thanks for letting me know about this Google program. I think you should embed the official YouTube video explaining about helpouts at the top of the post so that it would be helpful for people like me who are living under the rock. This really does sound interesting, Enstine. Thanks for writing this and recommending Joel Comm’s course. I do know about Google Helpouts but haven’t bothered too much with it. It’s indeed a way to make money online and is definitely worth exploring further. And since it’s coming from Google, it’s certainly not something to scuff at. Google does get it right in lots of things, and this might be one of them. I think this will be especially good for those who have problems with receiving payments because of where they are based in the world. Since Google adsense could pay, regardless of where one is based, this should be the same, and should solve the problem of those who, for example, don’t have Paypal. About the Google Helpouts itself… who isn’t an expert in “something” these days, right? As hard to believe as it may seem, there are surely lots of people out there who are willing to pay for what other people know. Thankfully this makes all that possible. About Joel Comm, all those in the early days of adsense certainly know him as the “adsense guru”, with his many “adsense theme” products and courses. I think he knows what he’s talking about when it comes to this as well. So, I’d say this is obviously worth checking out. Thanks, again, for recommending this course, Enstine, and for sharing this post on Kingged.com . I have argued…and will continue to argue, that this is one course that will sure be worth any blogger’s time who is interested. Its really interesting to see the benefits of enrolling in the HelpoutProfits. It sounds promising and could offer marketers additional means of making money online. However, the credibility and professionalism of Joel Comm & Joshua Writer are what would sell this course than anything else. Thanks for sharing this Enstine! I have left this comment in the content syndicatioon and social bookmarking website for Internet marketers – kingged.com where this post was shared. I guess it is true that we learn something new everyday. Even though I don’t blog for cash, this is definitely some good information to have and know about. I have heard about the Google helpout last year and i must confess that this is a brilliant innovation coming out from them. Thanks for recommending this affiliate course with us Enstine and for helping those interested to not make a mistake on Helpouts. Honestly interesting for all of us wanted to know how to earn money via online. I’ll check it out. It’s seems interesting and exciting. Yes, it is giving us a nice opportunity to make some extra money while helping other. Thank You very much for sharing this course too. Kumar Chandan recently posted…Let’s designed Social Media do the talking. Thanks for that idea. google help our is a good stuff to know, i am just discovering it now i hope to explore it. It is great you have share this information. Enstine, thanks for creating this awareness about Google Helpouts and how to make money using it. I am not a cynic, but past experiences have made it such that it is difficult to trust whatever package Google brings on stream each time. Google has brought several programmes that ended up breaking the hearts of their users. I do hope this would not be one of them too. Well, there is no harm in trying it out and making money with it as long as it lasts. If eventually it gets taken away in the future, at least one would have made something reasonable from it then. I think it is great innovation by the might Internet giants; this keeps putting Google ahead of their competitors because they are thinking ahead and bringing new ideas. Everyone who has got something to offer in form of help should take leverage of this and swell his bank account even as he renders help to others. Thanks once again for sharing. Remain blessed. I think the only way to prevent this heartbreak is never to take Google serious; you just use the site having it at the back of your mind that it could be taken down anytime Google feels like it. One can never trust them lol.